Observation - Fungus. Daldinia concentrica? - UK and Ireland. Description: Round black fungus growing on live tree overhaning a river in a sheltered valley woodland, about 6-9 cms in size. 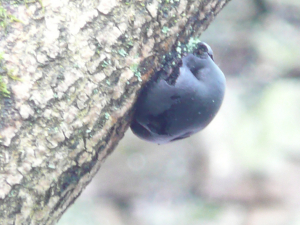 Round black fungus growing on live tree overhaning a river in a sheltered valley woodland, about 6-9 cms in size.